2016 was a time of much, sometimes dramatic, political change, including the unexpected result in the UK’s Brexit referendum and the election of US President Donald Trump. Those changes will of course affect the future of international arbitration. Overall, 2016 however saw measured progress towards meeting some of the criticisms of arbitration, including through revisions to institutional arbitration rules designed to tailor the process to the needs of a more diverse group of users and to make it more efficient and cost-effective. For 2017, we anticipate continued efforts to optimize international arbitration procedure for both commercial and investment treaty proceedings and we expect that these efforts will continue to bring new participants and an ever-increasing range of subject matter into the system. Third party funding moves into the mainstream. In 2016, third party funding expanded its footprint – and attracted greater scrutiny. Arbitration aims for new sectors. An ICC report explores the reasons arbitration has been less widely used than it might be by financial institutions. Speed and cost. Arbitration institutions adopt new approaches to meeting user critiques about the cost and duration of arbitration proceedings. Free trade trumped – and whither ISDS? With CETA agreed, TTIP on hold, the US out of the TPP and NAFTA set to be revisited, 2017 ushers in an uncertain future for trade and investment agreements and the regime of investor-state arbitration they incorporate. Broadening the pool of arbitrators. The drive for greater diversity in arbitrator appointments gains momentum and yields ethics benefits. Brexit: impact on London as an arbitration seat. Brexit has shaken the political landscape but leaves the regime for arbitration in London standing strong. Russian arbitration reform – half measures? Legislative reform in Russia brings some welcome harmonisation but also sets traps for the unwary when it comes to the resolution of disputes involving Russian counterparties. Two steps forward, one steps back. 2016 saw a mix of reform and retrenchment in the approach to international arbitration in the Middle East. Perspectives from Asia. Economic developments in Asia drive disputes trends in the region. Resource nationalism in Africa – the next wave of investor claims? 2016 crystallised a trend of opportunistic resource nationalism in Africa and a consequential rise in investor-state disputes. 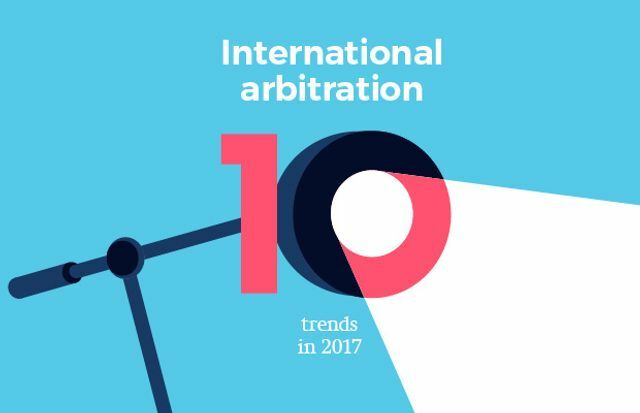 If you would like to speak about these trends further, our International Arbitration Team would be happy to speak with you.